Bust of Pindar. Marble, Roman copy after a Greek original of the fifth century B.C.E. in the Palazzo Nuovo, Rome, Italy, first floor, Hall of the Philosophers. Pindar (or Pindarus) (probably * 522 B.C.E. in Cynoscephalae; † 443 B.C.E. in Argos), was one of the canonical nine poets of ancient Greece who is considered, almost without dispute, to be the single greatest lyric poet of all Greek literature. Although critics of antiquity report that Pindar was a versatile poet who mastered a wide range of genres, only his odes have survived into the present-day. Although Pindar was influenced by earlier lyric poets, Stesichorus in particular, he is now considered by many to be the founder of the ode as a poetic form. His influence on the development of later ancient lyric poetry, well into the Latin era, is tremendous. It is a testament to his triumphant skill as a poet that, although only a tiny fraction of his works have survived, what works remain are considered to be among the most valuable masterpieces of antiquity. Pindar was born at Cynoscephalae, a village in Thebes. He was the son of Daiphantus and Cleodice. The traditions of his family have left their impression on his poetry, and are not without importance for a correct estimate of his relation to his contemporaries. The clan of the Aegidae – tracing their line from the hero Aegeus – belonged to the elder nobility of Thebes. 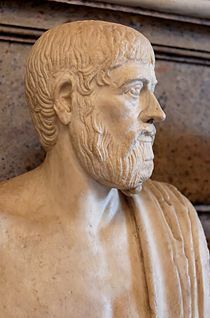 It is no doubt due in part to this aristocratic background that Pindar — in contrast to a number of other Greek poets of his times — remained staunchly patriotic and traditional in the majority of his works. Employing himself by writing choral works in praise of notable personages, events and princes, his house in Thebes was spared by Alexander the Great in recognition of the complimentary works composed for king Alexander I of Macedon. 2 books of dithuramboi "dithyrhambs"
2 books of prosodia "preludes"
3 books of parthenia "songs for maidens"
2 books of huporchemata "songs to support dancing"
1 book of enkomia "praise-songs"
1 book of threnoi "laments"
4 books of epinikia "victory odes"
Of this vast and varied corpus, only the victory odes survive in complete form. The rest are known to us only by quotations in other ancient authors or papyrus scraps unearthed in Egypt. Pindar is said to have begun his training as a poet through music: he received lessons in lyre-playing from one Scopelinus at Thebes, and afterwards to have studied at Athens under the musicians Apollodorus and Lasus of Hermione. Several passages in Pindar's extant odes glance at the long technical development of Greek lyric poetry before his time, and at the various elements of musical, performative, and literary art which the lyricist was required to temper into a harmonious whole. The fact that stands out is that Pindar was precocious, laborious, and widely trained in all the arts of classic Greece. Pindar's wife's name was Megacleia, and he had a son named Daiphantus and two daughters, Eumetis and Protomache. He is said to have died at Argos, at the age of 79 in 443 B.C.E.. This page was last modified on 28 March 2019, at 16:38.